Wake up to a healthy start in the morning and power up with this breakfast oatmeal (a combination of homemade muesli and milk, boosted by antioxidants-rich fresh fruits and BetterBody Foods Superfood Blend) and peanut butter on whole-wheat bread. In our family, we have peanut butter on toast almost every day. 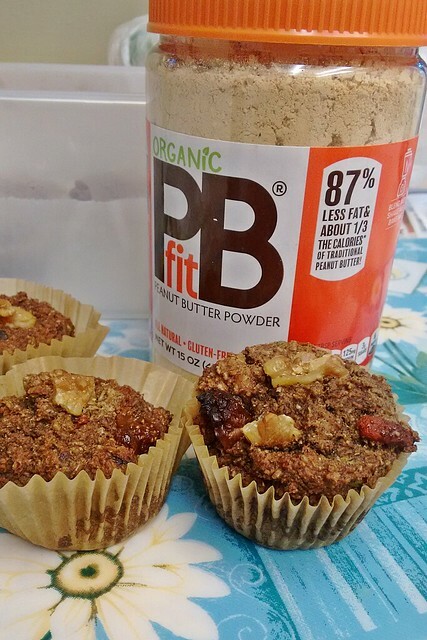 Since it is a breakfast staple, a healthier peanut butter like PBfit Powdered Nut Butter - with 87% less fat than traditional peanut butter and 1/3 the calories - makes a great alternative. Powdered peanut butter also means more versatility in usage; as peanut butter can now be easily added (no more sticky spoons or scoops!) to smoothies and your favorite bakes - cakes, cookies, and muffins. Imagine...no more waiting (and waiting...) for the creamy peanut butter to drip down slowly the tablespoon, and no more trying to get the last bit wiped off completely from the spoon or scoop! 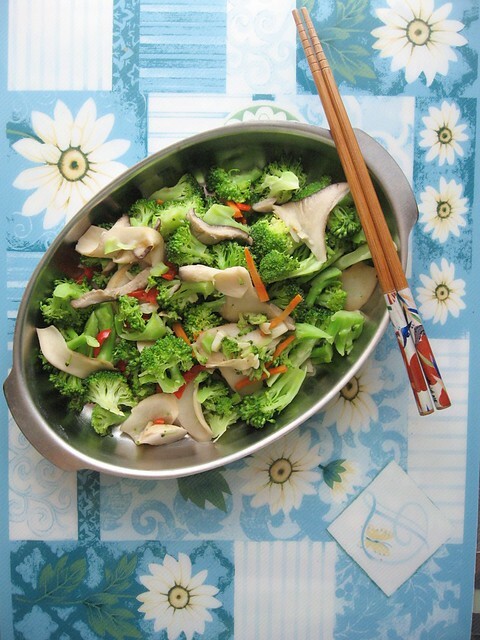 This Broccoli and Oyster Mushrooms Stir-Fry is a simple and delicious vegetarian dish - one of the many vegetables and mushrooms combination stir-fries (with shiitake mushrooms, maitake mushrooms or even pink oyster mushrooms) already featured in my website. Without using meat, mushroom is an ingredient that adds earthy flavors and "meaty" texture to a vegetarian dish. To complete the entire stir-fry with less oil, I have used the partial stir-fry-steam method, which is to cover the pan or pot and allow the steam to finish off cooking the vegetables in the process of stir-frying. Making your own marinara sauce from scratch is not difficult. But when you are pressed for time, even 15 minutes is a lot of time. Store-bought marinara sauce makes meal preparation easier and reduces cooking time as there is no need to prep. the onions, garlic, tomatoes; and it is not necessary to wait for the ingredients to cook down over the stove. Pasta marinara sauce is not only good for pasta, it is also quite handy as "seasoning" sauce. 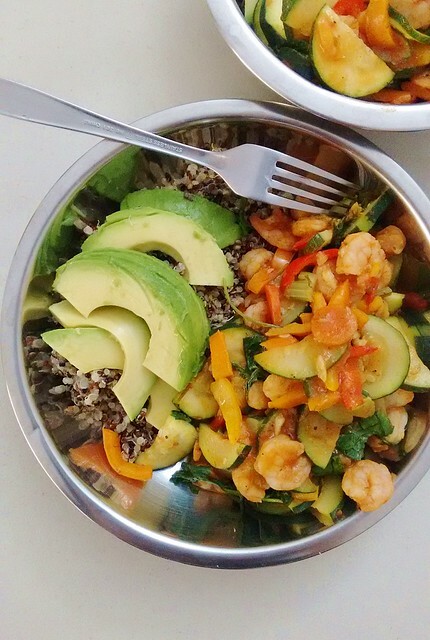 For example, simply think shrimps and vegetables stir-fry with tomato-based "seasoning sauce" . Oh, isn't that sweet and sour shrimps? Quite close. Sweet and soup or tomato-sauce shrimps is the protein feature of the grain bowl today. With store-bought marinara sauce, these delicious tomato-sauce shrimps can be prepared in less than 20 minutes.